Because I really suspected I might get a slap. 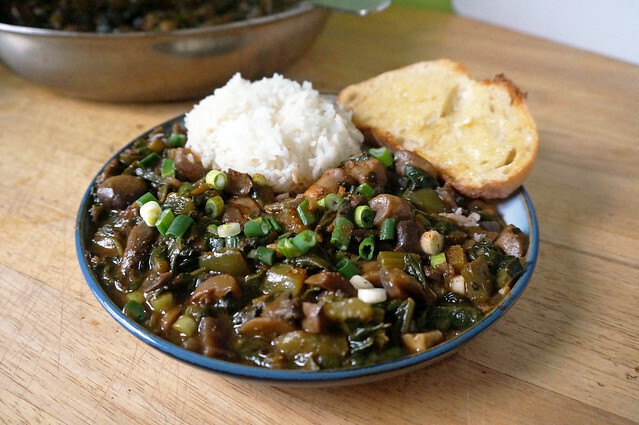 The recipe’s inspired by a dish served at local restaurant Da Levee, which is called “spinach mushroom etouffee.” And I do like their dish: it’s both rich and simple, full of good flavor. I eat at Da Levee most Wednesdays during a long walk between work and a particular evening rehearsal, and I enjoy it. But with all apologies to the folks at the restaurant, it’s not a paragon of tradition: everything tastes like someone described some basic characteristics of South Louisiana cuisine to a Midwesterner and then said “I’m sure you’ll figure it out.” There are definitely some menu items that might get you run out of town in Cajun country, and I had a strong suspicion that this might be one of them. Which is all a very long preamble to saying that, if you’re not from Louisiana, this may look like a plausible Cajun or Creole dish, but I’m here to tell you it’s not. Whereas if you’re from Louisiana this may look like a bizarre transplantation of South Louisiana ingredients and techniques into a dish where they really don’t fit — and you’re right. I’m choosing to publish the recipe anyway, because I’m terribly pleased with how it came out, despite its inauthenticity. I’m choosing to go with the designation ‘smothered’, because while that term does have a specific meaning in Louisiana (which I’m not fully aligned with), it also has a wider variety of meanings in Southern cooking generally, and I feel more comfortable there. Smothering (generally) involves cooking a protein or a vegetable with a variety of other seasoning vegetables in a small amount of water; it amounts to a stovetop braise that creates a vegetable gravy for whatever’s being smothered. I doubt there’s anyone in the American South who’d look at the dish and say “yep, that’s the way I smother,” but my intuition, as a displaced Southerner myself, is that most cooks would at least say “but I guess somebody might do that.” That somebody, I guess, is me. No matter where you’re from, give it a try: plump meaty mushrooms, a velvety gravy studded with chunks of flavorful vegetables, a smoky backbone from a medium-dark roux: I’m still not entirely sure what the hell I’m making, but I know I like it. This recipe’s a strange beast, a hodgepodge of certain Louisiana ingredients and techniques with other totally foreign ones. Somehow it all adds up to a dish that I rather enjoy, and with some rice and hot sauce it’s remarkably fortifying against the late winter slush. 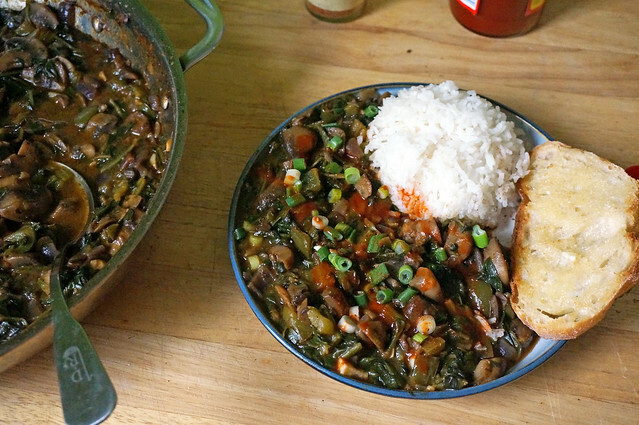 Inspired by the Spinach Mushroom Etouffee at Da Levee. 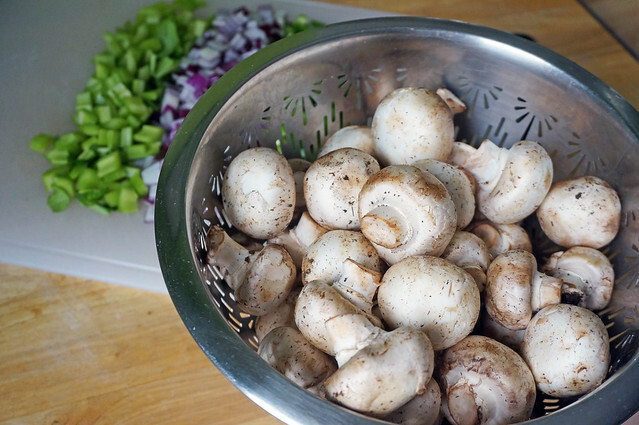 In a large, deep skillet or saucepan over medium-high heat, cook the mushrooms in the 2 Tbsp vegetable oil. They will release a lot of liquid, which will then boil away as the mushrooms brown; this should take about 15 minutes total. 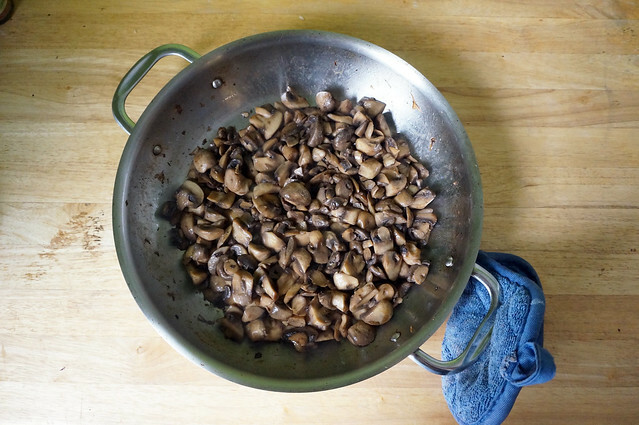 Once you’ve boiled away all the mushroom liquid, remove the cooked mushrooms to a bowl. Wipe out the skillet, then combine the flour and the 1/3 cup vegetable oil in it over medium-high to high heat. Stir continuously until the roux reaches a dark reddish brown, near the color of old rust. This only takes about five minutes over a fairly high flame, but you might want to go slower — see the Note on roux. Once the roux reaches a dark reddish brown, immediately add the onion, bell pepper, celery, and garlic. Stir continuously for five minutes, until the vegetables have softened somewhat. Add the water slowly, stirring in the roux, and bring to a boil. 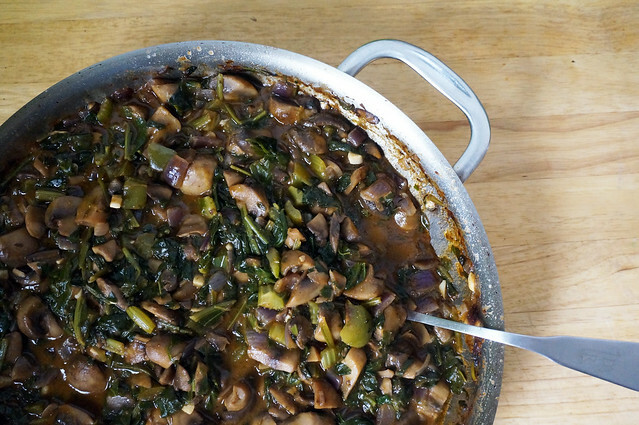 Add the reserved mushrooms with their juices, the spinach, and the seasonings, bring to a boil, and simmer for 30 minutes. 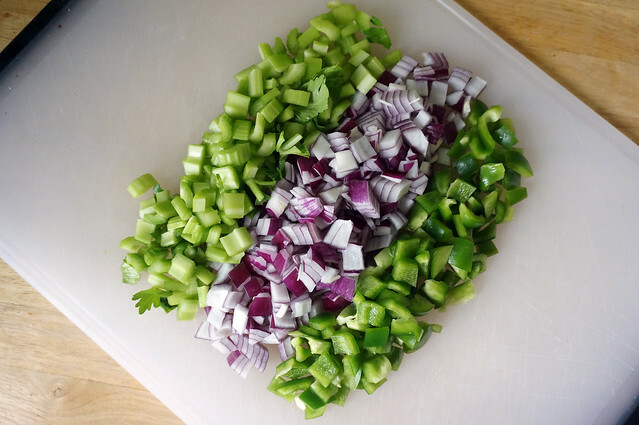 To serve, I like a nice scattering of chopped green onion or parsley, as well as some extra lashings of hot sauce. Serve with a good helping of rice and some buttered bread. Roux: It’s important to do the roux right, because (1) if you scorch it you have no choice but to start over; (2) the roux can splash, and it’s sticky —I guarantee you won’t like the feeling on your skin. As I’ve noted, you can get the roux to my desired color in five minutes over a strong flame, but if you’re not accustomed to doing so it’s tricky. There’s no shame in keeping the heat lower; it’ll take longer, but that’s far better than accidentally burning the roux because you’ve just splashed a big glob of hot fat and flour onto your hand. Creole seasoning: Around my house, I mix up my own Creole seasoning using Chuck Taggart’s recipe at Gumbo Pages (sometimes subbing in smoked paprika for part or all of the sweet paprika). If you’d prefer to use a store-bought Creole seasoning, such as Tony Chachere’s, be aware that many blends already include salt — don’t add the salt I call for unless you like things very salty indeed! For an even richer dish, you could swap in some stock (vegetable or chicken) for the water. A small can of diced tomatoes, and/or a couple tablespoons of tomato paste, could be a nice addition along with the water and seasonings.